Enlarging photos appears to be a simple and mundane task for the average user. But as a pro, you understand the ramifications of firing up Photoshop and just using the Image Size dialog box, or worse yet, just stretching an image in your page layout application. 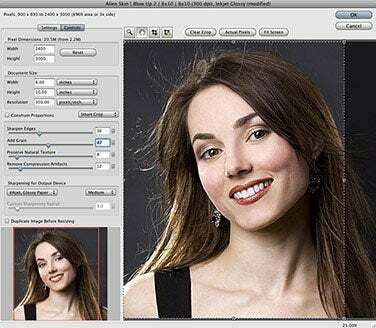 Blow Up 2, from Alien Skin Software, is a Photoshop plugin that produces high-quality image enlargements by using an algorithm which temporarily converts pixels in your photo to vectors. The results are a sharper, more detailed enlargement. Out of the box, Blow Up works with images in Grayscale, Duotone, RGB, CMYK, and Lab color spaces, unlike Genuine Fractals Pro, a competitor to Blow Up 2, which costs $50 more for this flexibility. Blow Up is also the only resizing plugin that supports 32-bit images, along with 16 and 8-bit files as well. Once installed, Blow Up is found in Photoshop’s File -> Automate menu, an odd location by most standards. Thankfully, that’s really the most confusing aspect of using the plugin—everything else is straightforward. Also, unlike competing plugins, Blow Up doesn’t require you to save an external file, then re-open it at the desired size—you work in one file and the enlargement is produced immediately upon committing your preferred settings. The Blow Up dialog window offers a surprising amount of control and features. A Settings tab offers more than 100 presets for common output sizes and paper types, making cropping and resizing a one-click affair. For more precise results, you can use the Controls tab. Along with standard sizing, resolution, and cropping tools, Blow Up features an Auto-Crop option—so if you have a horizontal image and want to resize it for vertical output, Blow Up will intelligently crop the image. In my tests, it worked quite well in most cases. 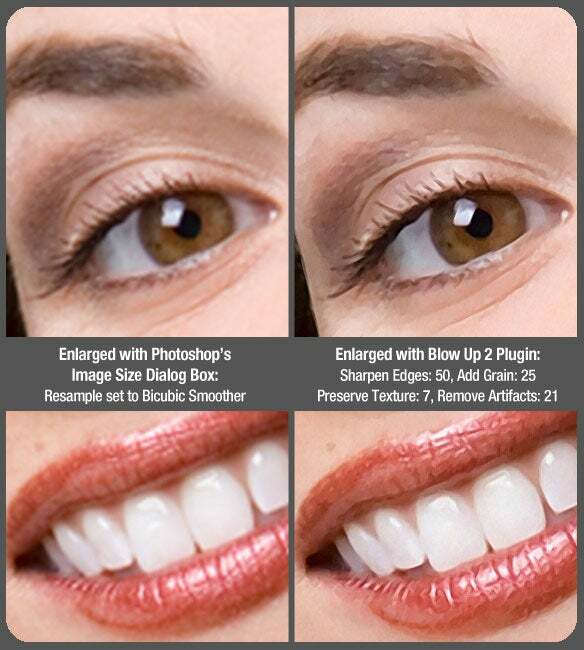 Once you decide on the desired output size, resolution, and cropping of your image, you can move on to using a few image adjustments to assist in creating the best possible appearance of your enlarged image. With simple sliders or number input boxes, you can adjust a few aspects of the image you see in the preview panel to the right of the controls, which is updated on-the-fly. Add Grain: You would think that the goal is to remove grain, but it actually serves to produce a more detailed and natural image. Preserve Natural Texture: This adjustment creates a more organic look to textured areas of a low-resolution image. Remove Compression Artifacts: Here, you’re removing blocky artifacts and edge halos created when enlarging an image. So what were the results of my tests? I used several different images—some grayscale, some color—with a variety of subject matter. The results in all cases were quite good, with some being nothing short of stunning. For the sample image below, I took a 3-by-4.5-inch image at 300 dpi, and enlarged it to 9-by-13.5 inches (still at 300 dpi). Using Photoshop’s standard Image Size dialog box produced the results on the left, Blow Up results are displayed on the right. As you can see, the results are dramatically different. When printed and viewed at full resolution, the Blow Up enlargement looks significantly sharper—to the point where only the most trained eye can tell the image was enlarged. The screenshots just don’t do it justice. When a low-resolution image is all we have to work from, enlarging them with Photoshop alone generally yields completely unacceptable results. Blow Up surprised me in this area. I took a 500-by-750-pixel image at 72 dpi (screen resolution) and enlarged it to 7-by-10.5 inches at 300 dpi. I adjusted the previously mentioned settings and also used the custom output sharpening radius slider. While the results weren’t nearly as great as when you start with a high-resolution source image, it was still quite impressive. In fact, it was more than good enough for high-quality commercial printing by my standards—this of course varies with image quality. Priced at $249, Blow Up 2 isn’t for everyone. It’s certainly not the tool for those who only occasionally have the use for such a plugin. But if your work involves bus/car-wraps, outdoor boards, large-format printing or you have clients who frequently provide you with small or low-resolution images, Blow Up will pay for itself in no time, especially since it offers a Batch option. In general, I found nothing to complain about outside of the odd location in the Automation menu. Blow Up 2 requires Photoshop CS2 and later or Photoshop Elements 4.0.1 and later. It runs on Macs powered by either a G5 or Intel processor. A 30-day demo of Blow Up 2 is available from the Alien Skin Web site.